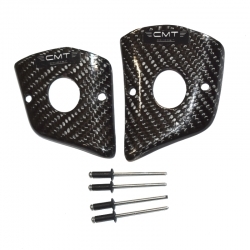 Carbon rear pump protection, made of carbon for Kawasaki KXF 450 2019 models, that serves to protect the rear brake pump from possible shocks, external agents and rubbing caused by the use of boots. Manual finishing and polishing without the use of transparent paints. 100% quality, lightness and strength.